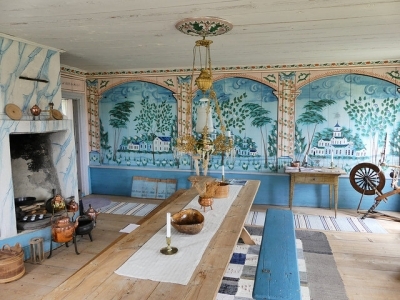 The Decorated Farmhouses of Hälsingland are seven large timber farmhouses with richly decorated interiors. They date mainly from the 18th and 19th centuries. The decorations were made in the regional folk art tradition, and reflect the prosperity of the farmers of that period. A special room or even a separate house was set aside for festivities. They are located in the rural landscape of a small region called Hälsingland. I was looking forward to write a first review of this new WHS. It sounded like just the kind of site I enjoy: rural, remote, vernacular architecture. So I had added it to my short trip to Sweden already before the WHC announced that the Farms were granted WH status. Unfortunately, my visit turned into a big disappointment. "Searching" for a WHS is part of the life of a WH spotter, and it can be a joyful part of the visiting experience. Since this was a new heritage, there was still not much known about it. In advance I did my research via the Internet and discovered that 3 out of 7 farms are located along the route between the copper mine of Falun and the highway south towards Stockholm. For only 1 out of the 3 I was sure that it is opened to visitors (most of these farms are still lived in by the owners). I first stopped in the hamlet Langhed - unknown to my TomTom navigation, but I was just able to find it using a map that I had printed. Well, it turned out that Langhed is full of traditional red wooden farmhouses, but the 2 of them that are designated as WHS I could not find among them. There were no signs. At least not to these 2 farms: originally the nomination was much larger, in this region there are about 400 of these kind of farms. Some are now used as bed & breakfasts or restaurants. But most are just private homes. It was a nice village to drive through, but I had not earned to tick it off. That I had left for a farm some 50 kilometers away, in the village of Söderala. The Erik-Anders farm is open daily for everyone in summer. But here also I had the greatest difficulty to find it. I drove three times through the town’s main street in search of a clue. I also tried all side streets (not so many fortunately), but nothing turned up. I didn’t want to leave without trying everything, and decided to go for a last try and ask around. Just then I discovered another exit from the main road. And even a sign to the Erik-Anders farm. It turned out to be a mile or 2 away from the town, on a small street hidden in the forest. I was so surprised to see that I was not even the only visitor, but that there were already 6 people or so enjoying a coffee and cake in the farm’s cafe. The owners had even made a special visitor parking on a nearby lawn. And they charged an entrance fee of 40 krones to the interior of the decorated house, a separate building from the main farm. There was also ample information available in both Swedish and English. It’s all quite small however, and that’s no problem as long as the interior would have given me a “Wow!”-feeling after I entered. But it did nothing for me, it felt like just any old farmhouse that one can see in Germany or the Netherlands. There are painted decorations around door openings and just below the ceiling. And a lot of its uniqueness seems to lie in the use of wallpaper. Hello – a WHS about wallpaper? Maybe I visited a lesser impressive example of these 7 farmhouses. I’ve seen more flashy decorations on the Hälsingland farms website, so maybe there’s something in it after all. I would love to hear from others which farms they visited, and what their impression was. Visited Erik-Anders house in August 2018. This is lovely village timber house, richly decorated with colorful wallpapers and spacious rooms. This house is the only easily available house among seven inscribed ones. Afterwards I drove to Jon-Lars and Pallars, which were already closed for visits. They are only open during mid-summer time, and seasonal opening information could be found on the official website of Hälsingland farmhouses. They also try to promote non-inscribed houses and, for example, Edsbyn & Alfta Tourist Bureau also had such non-listed house which turned out to be very interesting to visit (free of charge). Jon-Lars and Pallars locations are indeed to be checked in advance in order to arrive to proper sites as they quite tricky to find. Then I headed to Bortom AA, but since there was around one hour to wait before the next obligatory guided tour and I had some time restrictions, I was limited to a pleasant stroll around the area. This is not blockbuster site, but it was quite curious to discover how the people covering quite sizeable region and living over 200 years ago came to an idea to decorate their houses despite of many other problems (water, harvest, cows, cold, etc.) facing them. I visited this WHS in June 2018. The Decorated Farmhouses of Hälsingland are one of those great WHS which I would have never visited were it not for their inscription on the WH list. Even more so, since their beauty lies mostly in their decorated interior. 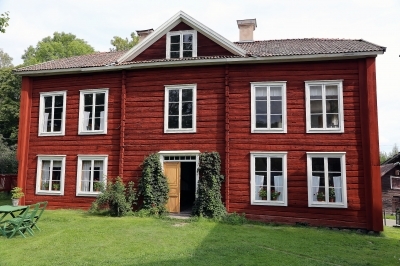 There are more than 400 of these decorated farmhouses (some you can sleep over in) and the vast majority are very similar with falun red painting. Since inscription, street signs with the UNESCO symbol have been placed near the inscribed farmhouses. From Falun I drove towards Alfta to the restored and non-inscribed Ol Anderson decorated farmhouse which also houses an emigrants museum. During July and August, the visitor centre is open everyday from 11:00 to 17:00, during May, June and September it's open Friday to Sunday (11:00 to 15:00) and from October to April it's open only on Sundays (11:00 to 15:00). The staff here were extremely helpful and went out of their way to provide information, books, leaflets and contact numbers to visit the inscribed and privately-owned decorated farmhouses. There also is one of the UNESCO WHS inscription certificates in the visitor centre, even though each of the houses I visited proudly displayed one of these certificates too. In June when I visited, daily guided tours were supposed to be organised at the Pallars and Jon-Lars decorated farmhouses, usually starting with Jon-Lars' at 14:00 and proceeding with Pallars' at 15:00. The combined guided tour costs a whopping 400kr per person or 220kr if you intend to visit only one. On the day of my visit, a group of American tourists from a cruise-liner in Tallinn (!!!) had prebooked an early morning visit to Jon-Lars' followed by lunch and an afternoon visit at Pallars'. Since the main guide who does both these guided tours, Kersti Hisred (070-3756664), only does a tour of each of these houses daily (mostly for Pallars' since it is much more in demand), I thought I had to make do with a visit at Pallars'. However, as soon as the visitor centre's staff found out that I had visited over 400 WHS, they were so impressed that they gave me Jon-Lars' direct contact number (Mr. Hakan 070-3173393) and he was so kind as to welcome me to his decorated farmhouse on my own. Needless to say, even though the Pallars' farmhouse is bigger and the painted room decorations are more intricate, visiting with another 15 talkative tourists and a guide, felt not only rushed but almost disrespectful to the cosy and quiet atmosphere inside the farmhouses. That said, the painted room alone is worthy of inscription and of a visit. 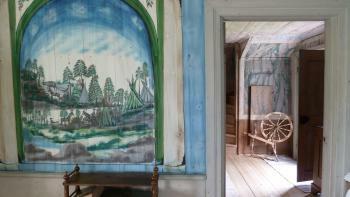 The unexpected highlight of my visit was the painted room inside Jon-Lars' decorated farmhouse (photo). Mr. Hakan gave me a leaflet in English with some information on the main aspects and history of the rooms which was more than enough. The colourful wallpaper and blue faux marble of the chimney in the other rooms were worth viewing but what made this visit extra special were the stories the owner told me in relation to most items in the farmhouse especially in the painted room. These stories were passed on from generation to generation over the past 400 years or so. To reach the Jon-Lars and Pallars decorated houses, you simply need to follow the brown Stora Halsingegardars Vag sign with a flower to Långhed and you can't miss them. On our way to the High Coast we stopped at Söderala to visit the rather plain but more accessible Erik-Anders decorated farmhouse. Entrance costs 50 kroner without a guide or 100 kroner for the guided tour at 14:00 and it is open everyday (24th June to 31st August 11:00-17:00, 1st September to 28th October 12:00 to 15:00, and 1st april to 17th June 12:00 to 15:00). 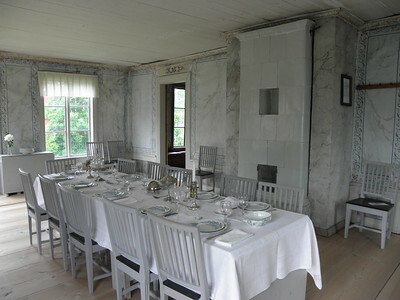 The highlight in Erik-Anders is the Great Hall with sky blue faux marble walls, colour-matched with the tiled stove. Due to the unforgettable experience, this WHS visit was very special and one of my favourite in Sweden. 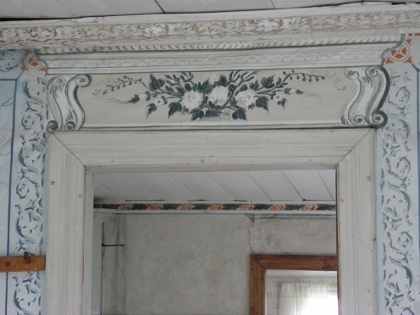 I'd love to visit the remaining decorated farmhouses if I'm in Sweden again in the near future. Another non-inscribed decorated farmhouse worth visiting is the Martes decorated farmhouse in Edsbyn with its 1700s baroque paintings in the festivities room. I can certainly see how others could be left uninspired by a visit to these, however we had a rather enjoyable trip to see, staying in a highly recommended farmhouse in the hamlet of Långhed. This also enabled us to have a tour of one of the inscribed farmsteads. It felt like a treat and as if we were privy to something special. After what I can only describe as one of the greatest breakfasts I have ever had we were well set up for the day. Swedish accommodation is astonishing for this, there is just something about their simple high quality ingredients that just always hits the spot, the bread our host had sourced for us was the best I have ever had. In terms of the world heritage site we visited Pallars. It isn't normally open but our bed and breakfast owner was a friend of the owner of the farm and he was able to arrange a private viewing. I felt a little awkward stood there waiting as the presumably elderly owner was woken by our arrival and then shuffled up behind the curtains of the main house, cracked open the door and slid out a set of keys so big it was like they were from a cartoon. This was very much in private ownership, and we felt rather privileged to be allowed in. The farm was made up of three buildings, the main house was our gracious but hidden hosts home, so not in the tour. Thus the first building we visited was the real highlight of the complex. This one contained some rather impressive watercolour paintings that decorate the guest bedroom. Now visiting world heritage sites you get to see some amazing paintings by some of the world’s greatest artists, and it is fair to say that these are not in the same league, they are mostly only of local significance. However I found them exceptionally charming, the pale blue scenes of local life and nearby cities certainly left an impression. The rest of the building was nice, being a collection of well appointed rooms, though in comparison to the bedroom they were rather mundane. We then headed across the courtyard to another building; this was again a well preserved rural guesthouse with some neat decoration and wonderful collection of pastoral antiques, which our guide took great pleasure in explaining and showing in detail. There was also an impressive stove and baking paraphernalia, mixed in amongst the everyday odds and ends you would expect to find in someone’s out building. The fact that it was obviously still someone’s home really added to the charm, and again made us feel quite privileged that we were able to visit. To be honest I’m not sure if they are worthy of a place on the list. But our trip was certainly rewarding, and as ever this hunting of World Heritage Sites brought us well of the beaten track and helped us enjoy a mid-summers night in a rural Swedish hamlet. That alone was worth the journey. It was really hard to gather information about this WHS. As much as I know the houses are either privately owned or not accessible for about 11 month a year. I “visited” the Erik-Anders farm in Söderala. They way to the farm is now signposted so I found it in no time coming from Stockholm (E4 – exit Söderala a few km before Södermalm). I couldn’t see much more than a house that looked exactly like almost every house in Sweden. If I trust Els’s review I didn't miss much inside the house. I’m going to add this site to my list of odd sites (like the Stoclet House or the Berlin Housing Estates). If anyone knows about one of these houses being both publicly accessible and worth a visit I will gladly go back, check it out and eventually change my mind. 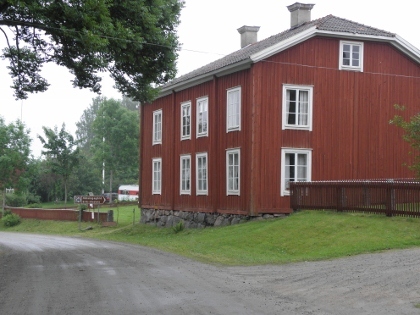 WHS Farmhouses of Hälsingland: Unfortunately you tried to find those two that are completely private homes, and therefore not have signs, though they have had guided tours during the summer 2012 announced at the touristoffices. Pallars have paintings made by the bluepainter, remarkable landscapes. 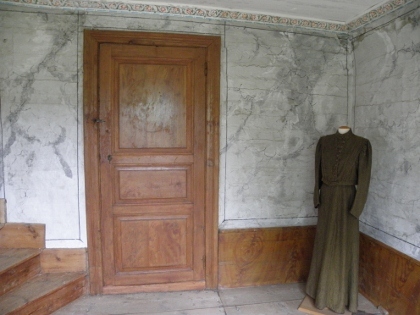 A certain stop for the crownprincess Victoria when visiting the area with her sister Madeleine, the duchesse of Hälsingland-Gästrikland, while one of the paintings show the crownprincess own castle of Haga. For me a WOW feeling! The problem has been to compromise private ownership, availability, highly decorated ... in the same object. Please do visit a couple of them all around the region of Hälsingland and I believe you will be able to feel the WOW feeling!